Here’s surprising news — the ambitious, offbeat musical Next to Normal, by Tom Kitt and Brian Yorkey, won the Pulitzer Prize for drama this afternoon. 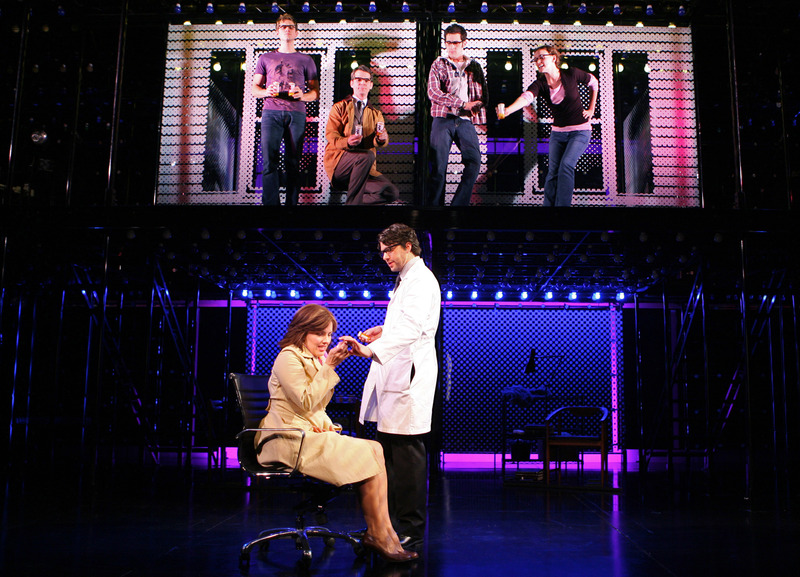 The show, about a woman struggling with bipolar disorder and its effects on her family, opened on Broadway in April 2009 and is still playing. Next to Normal won three Tonys last spring — for best score, for best orchestrations and for Alice Ripley as best actress in a musical. I have been trying to post my review of the show from last spring, but the Sentinel blogs seem to be down. I’ll try again later. Going from Billy Elliot to Next to Normal is a journey — a trip from an old-fashioned musical (albeit with some contemporary bells and whistles) to be that feels brand-new. Think of the subject matter of the musicals of William Finn (Falsettos, A New Brain) and you’ll be in the territory of Tom Kitt and Brian Yorkey, whose six-person musical Next to Normal started out off-Broadway early last year, moved to Arena Stage in DC for a complete overhaul and then made the trip to Broadway earlier this spring. With just six actors and a rock-infused score, Kitt and Yorkey take on mental illness — specifically the illness of a woman named Diana (Alice Ripley, of Side Show), who has lived with depression and other symptoms for nearly her whole adult life. Turns out there was a trigger in his past, but neither her husband (J. Robert Spencer, of Jersey Boys) nor her doctor (Louis Hobson) can cure her, and the three teenagers in her life –son Gabe (Aaron Tveit), daughter Natalie (Jennifer Damiano, from Spring Awakening) and her boyfriend Henry (Adam Chanler-Berat) can make it all right. I thought of William Finn because of some of the song titles (“Who’s Crazy/My Psychopharmacologist and I”) and because of the immense sympathy with which Kitt and Yorkey see damaged people. But Next to Normal has a different, less jokey feel, and Diana’s problems are heightened as she abandons her pills and moves on to electroconvulsive therapy — what most people call shock treatments, which leave her forgetting her own child. Director Michael Greif (Rent) has staged Next to Normal in a kind of modern erector-set set, with startling rows of lights that change the mood in an instant. And the entire cast is terrific — especially Spencer as the loyal, if less than understanding, husband; Damiano as the neglected teenage daughter and the wonderful Ripley as Diana, a woman who is desperate to live. This is not feel-good musical theater. But it’s musical theater that makes you feel.